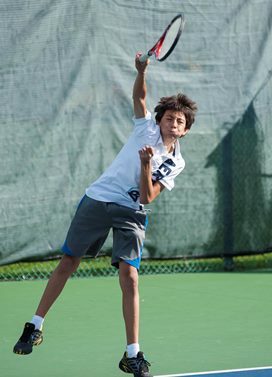 Once your “Little Ace” has become more skilled with their tennis technique and would like to develop in the sport further, the family might consider coaching at the NYTA Junior Academy. The North York Tennis Association (NYTA) has been successfully operating for over 30 years. It has gained a reputation for being the leader in junior tennis development in Canada. The NYTA atmosphere is fun yet goal oriented. With over 500 kids participating in the academy, the program has won awards from Tennis Canada and Ontario Tennis for every level of tennis. Students have excelled from the high quality coaching with some players reaching top rankings in Ontario and in Canada. The NYTA has been designated by Tennis Canada and the Ontario Tennis Association as a high performance tennis development center. There are three tennis court facilities centrally located in North York. The NYTA offers tennis programming year round to our students with after school programs during the winter, fall and spring and half and full day programs for the summer. All tennis lessons are held in a climate-controlled bubble. For more information about this program, please contact us at the NYTA office.